The main purpose of this study was to perform a treatment planning study for lung cancer comparing 2-field (2F) versus 3-field (3F) techniques in uniform scanning proton therapy (USPT). Ten clinically approved lung cancer treatment plans delivered using USPT at our proton center were included in this retrospective study. All 10 lung cases included 4D computed tomography (CT) simulation. The delineation of target volumes was done based on the maximum intensity projection (MIP) images. Both the 3F and 2F treatment plans were generated for the total dose of 74 cobalt-gray-equivalent (CGE) with a daily dose of 2 CGE. 3F plan was generated by adding an extra beam in the 2F plan. Various dosimetric parameters between 2F and 3F plans were evaluated. 3F plans produced better target coverage and conformality as well as lower mean dose to the lung, with absolute difference between 3F and 2F plans within 2%. In contrast, the addition of third beam led to increase of low-dose regions (V20 and V5) in the lung in 3F plans compared to the ones in 2F plans with absolute difference within 2%. Maximum dose to the spinal cord was lower in 2F plans. Mean dose to the heart and esophagus were comparable in both 3F and 2F plans. In conclusion, the 3F technique in USPT produced better target coverage and conformality, but increased the low-dose regions in the lung when compared to 2F technique. The most recent statistics on lung cancer provides an estimation of 224,210 new cases and 159,260 deaths in 2014. Lung cancer continues to be the leading cause of cancer-related deaths in the US. Proton therapy is one of the external beam radiation therapy (EBRT) techniques used for the lung cancer treatment. Since proton beams have finite range with no exit dose, most of the proton dose can be deposited in the tumor volume and spare the critical structures beyond the distal end of spread-out Bragg Peak (SOBP) region. Since beam delivery technique of USPT is different from that of passive scattering and IMPT, it is essential to address if the addition of uniform scanning proton beam has significant impact on the dosimetric results in the lung plans. The main purpose of this lung treatment planning study is to compare 2F versus 3F approach in USPT. The comparative analysis was done using various dosimetric parameters. Ten lung cancer patients treated with USPT at our proton center were included in this retrospective study. Among 10 cases, 5 of them had tumor in the right lung and the remaining 5 cases had tumor in the left lung. The age of the patients ranged from 57-79 years. The location of the tumor and clinical stage of the disease for each case is provided in [Table 1]. All 10 lung cancer patients underwent 4-dimensional computed tomography (4DCT) simulation in a head first supine position on a General Electric CT Scanner. Patients were immobilized using wing board, knee roll, and Vac-lok system (CIVCO Medical Solutions, Kalona, Iowa). The CT images were acquired using a slice thickness of 1.25 mm. The delineation of target volumes was done based on the institutional protocol. Specifically, internal gross tumor volume (IGTV) was contoured on the maximum intensity projection (MIP) images such that IGTV encompasses the GTV on all phases of respiration. From the MIP images, the average 4DCT was constructed for the treatment planning purpose. The clinical target volume (CTV) was generated by an isotropic expansion of 5-8 mm from the IGTV. The planning target volume was generated by expanding 5 mm from the CTV. The normal lung tissue was defined as the total lung volume excluding the CTV. Other OARs such as esophagus, spinal cord, and heart were contoured too. This retrospective study included treatment plans for the total dose of 74 cobalt-gray-equivalent (CGE) with a daily dose of 2 CGE. Furthermore, all ten lung plans were generated in the XiO treatment planning system (CMS Inc., St. Louis, MO). For this study, 2F plans were generated such that both proton fields have clinically feasible gantry and couch angles for the treatment delivery at our proton center. Additionally, maximum effort was made to select the appropriate beams with an objective of maximizing the target coverage while meeting our normal tissue dose constraints provided in [Table 2]. For a given case, 3F plan were regenerated from the corresponding 2F plan by adding an extra beam to it. Each treatment field was designed with an aperture of 0.8-1.0 cm margin around the PTV and a range compensator of 1.0 cm smearing radius. For the same proton beam in a given case, the apertures and compensators in 2F plan were identical to the ones in 3F plan. Dose calculations were performed using pencil beam algorithm  with a grid size of 3 × 3 × 3 mm. 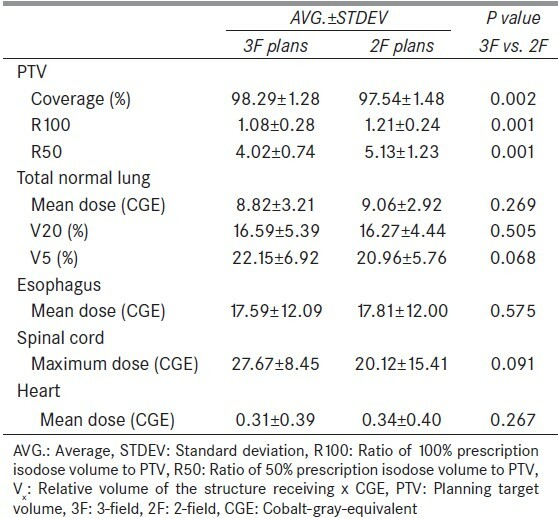 2F and 3F plans were compared using the dosimetric results obtained from dose-volume histogram (DVH). The PTV was compared for coverage (defined in equation 1), ratio of 100% prescription isodose volume to PTV (defined in equation 2), and ratio of 50% prescription isodose volume to PTV (defined in equation 3). 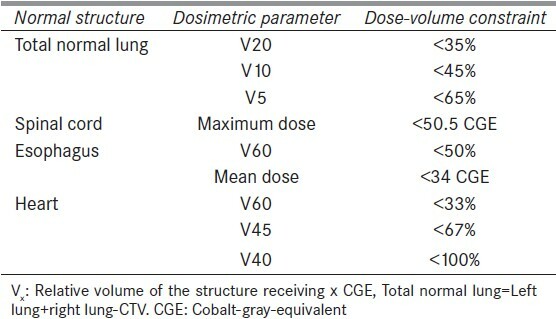 Normal lung was evaluated for the mean dose and the relative lung volume receiving dose equal to or greater than 5 and 20 Gy (V5 and V20, respectively). Esophagus and heart were evaluated for the mean dose, whereas the spinal cord was evaluated for the maximum dose. Paired two-sided student's t-test was carried out to observe the statistical differences between 2F and 3F plans. The statistical analysis was done using Microsoft Excel spreadsheet. The difference was considered statistically significant if the P < 0.05.
where F2 and F3 are the dosimetric results in F2 and F3 plans, respectively, for the dosimetric parameter x (e.g. mean dose, R100, etc.). [Figure 3] shows the dose color wash of the 3F and 2F plan for case number 7. The PTV results showed that the averaged coverage was slightly lower in 2F plans (97.54%) than in 3F plans (98.29%) with statistical difference (P = 0.002). Also, [Figure 2] demonstrates that the PTV coverage was lower in 2F plans for all ten cases, with D ranging from -0.08% to -1.34%. Both the R100 and R50 were lower in 3F plans than in 2F plans showing that 3F plans had better plan conformality. Specifically, on average, the R100 was 1.08 in 3F plans and 1.21 in 2F plans, whereas the R50 was 4.02 and 5.13 in 3F and 2F plans, respectively. The D ranged from 0.04-0.29 for R100 and from 0.18-2.59 for R50. For the lung, the averaged mean dose was slightly lower in 3F plans than in 2F plans (8.82 CGE vs. 9.06 CGE; P = 0.269) with D ranging from -0.83-1.23 CGE. In contrast, the averaged V20 and V5 were slightly higher in 3F plans than in 2F plans (V20: 16.59% vs. 16.27%; P = 0.505 and V5: 22.15% vs. 20.96%; P = 0.068). For both the esophagus and heart, the averaged mean dose was comparable in 3F and 2F plans and no statistical significance was observed (esophagus: 17.59 CGE vs. 17.81 CGE; P = 0.575, and heart: 0.31 CGE vs. 0.34 CGE; P = 0.267). For the spinal cord, the averaged maximum dose was lower in 2F plans (20.12 CGE) than in 3F plans (27.67 CGE), but the difference did not produce statistical significance (P = 0.091). [Table 4] provides the summary of the dosimetric results that are analyzed based on the tumor location in the lung. Specifically, the average D (x) is calculated for the right upper lobe (RUL) cases (N = 4) and left upper lobe (LUL) cases (N = 4). For PTV coverage, lung V20, and lung V5, the impact of number of treatment fields was slightly higher (larger absolute value of D in Table 4) in the LUL than in the RUL. For PTV R50, lung mean dose, esophagus mean dose, and cord maximum dose, the impact of number of treatment fields was found to be higher in the RUL than in the LUL. 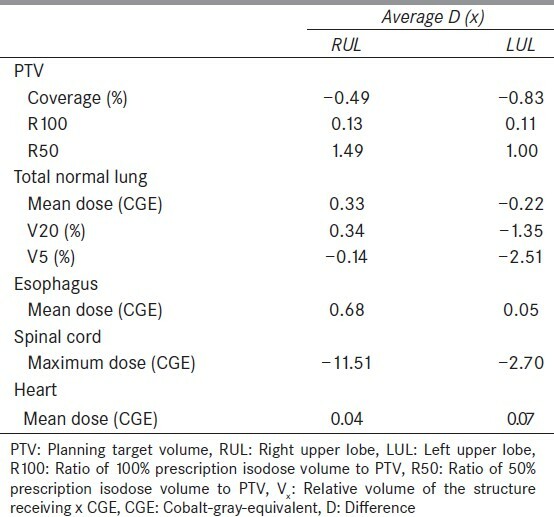 Other parameters (PTV R100 and heart mean dose) had very minimal difference in D (x) between RUL and LUL. In this study, we have evaluated the dosimetric impact of 3F versus 2F in USPT for lung cancer planning. The difference in the PTV coverage between 3F and 2F plans produced a clear trend, which showed that the addition of an extra beam in 2F plan produced better target coverage. This finding is consistent with previous study  , which demonstrated better target coverage using greater number of beams. The magnitude of absolute difference in the PTV coverage between 3F and 2F plans in our study, however, remains below 2%. Additionally, the results of both the R100 and R50 also produced a clear pattern showing that 3F technique has resulted slightly better plan conformality. Although the difference in the PTV values (coverage, R100, and R50) produced clear trends between 3F and 2F plans, no such clear trend was observed for the OARs. [Figure 2]: Second and third rows] For instance, 3F technique produced lower mean lung dose for the majority of the cases (N = 6), whereas 2F technique produced higher number of cases with lower V20 (N = 7) and V5 (N = 7). Similar result was observed by Macdonald et al. for both the IMPT and passive scattering, and the authors reported that low-dose regions were incrementally increased or not changed. Furthermore, the addition of beam in IMPT did not have substantial change in the mean dose to the OAR, whereas in passive scattering, the mean dose to the OAR was increased due to the addition of the beam. In our study, the addition of third beam tends to lower the mean lung dose with average difference of 0.24 CGE. In contrast, the addition of third beam led to increase the low-dose regions in the lung with average differences of -0.32% for V20 and -1.19% for V5. Studies have reported increasing risk of lung toxicity with increase in low-dose regions such as V5 and V20 of the lung. ,,, Although the absolute differences in lung V5 and V20 between 3F and 2F plans are not very large in this study, the use of 2F technique in USPT could be beneficial for lung cancer patients with pulmonary morbidities such as interstitial pneumonitis. The use of two proton beams for lung cancer planning in USPT could decrease the low-dose regions, thus reducing the probability of radiation-related lung injury. The 2F technique is also likely to reduce the total treatment time when compared to 3F technique. However, the use of less number of proton beams could lead to increase in lung dose due to uncertainties in the increased relative biological effectiveness (RBE) at the distal end of SOBP region. The clinical impact of using 3F versus 2F for lung cancer planning in proton therapy can be the subject of future research. One of the drawbacks of uniform scanning proton therapy planning is the lack of inverse planning technique, and all the plans in this study were generated using 3D conformal approach without plan optimization. Currently, IMPT has the feature of inverse planning, and by applying dose constraints during the optimization in IMPT, it is possible to obtain better dosimetric results than the ones presented in this study. We have attempted to analyze the results based on tumor location in RUL versus LUL. The tumor location, tumor volume, and patient anatomy typically vary among a group of patients. Hence, the number of beams required to obtain the optimal plan for the treatment of a lesion in the same region (e.g. RUL) may vary from one case to another. Nevertheless, based on the results presented in this study, we did not notice a clear trend showing the addition of third beam will produce either better or worse dosimetric results in the RUL than in the LUL (or vice-versa). Although dosimetric results for lung cancer proton planning may vary depending on the number of beams, treatment planner experience, treatment planning system, and beam delivery techniques, the primary objective of this study was to investigate the dosimetric differences in lung planning due to use of 2 beams versus 3 beams in XiO TPS for uniform scanning proton therapy. In conventional photon therapy, several investigators have reported the dependency of lung planning results on the type of dose calculation algorithm and treatment planning system. ,,,,, Recently, Zhuang et al., investigated the volume and location dependence on the differences between the Monte Carlo and pencil beam dose calculations, and reported that the differences were dependent on the PTV volume and location of the tumor. In our study, we did not use multiple dose calculation algorithms for treatment plan calculations, and it would be interesting to investigate if proton dose calculations for lung cancer depend on the proton dose calculation algorithm. Another challenge in proton therapy is the range uncertainty. At present, proton range uncertainty values used by different proton centers in the US are not the same. The uncertainty in the proton range calculations can be dependent on several factors (e.g. dose calculation, beam delivery, etc.) and the reduction of the range uncertainty can lead to decrease in the treatment volume, thus reducing dose to the normal tissues. For lung treatment planning in proton therapy, the change in internal density along the proton beam path as well as tumor shrinkage [Figure 4] can significantly affect the range, and the change in range during the course of treatment can cause the loss of target coverage and overdose of normal tissues. Additionally, treatment plans with larger aperture margins, which are based on the lateral penumbra, may result increased dose to the OARs. Limitation of treatment planning system in heterogeneous media must be investigated too. Future work involves the range and penumbra calculations in the presence of inhomogeneities and comparisons of calculated results with the measurements or Monte Carlo. 3F technique in USPT increased the PTV coverage by average difference of 0.75%, whereas the lung V5 was smaller using 2F technique by average difference of 1.19%. Maximum dose to the spinal cord was lower in 2F plans. Mean dose to the heart and esophagus were comparable in both 3F and 2F plans. Nihei K, Ogino T, Ishikura S, Nishimura H. High-dose proton beam therapy for Stage I non-small-cell lung cancer. Int J Radiat Oncol Biol Phys 2006;65:107-11. Nakayama H, Sugahara S, Tokita M, Satoh H, Tsuboi K, Ishikawa S, et al. Proton beam therapy for patients with medically inoperable stage I non-small-cell lung cancer at the university of tsukuba. Int J Radiat Oncol Biol Phys 2010;78:467-71. Bush DA, Slater JD, Shin BB, Cheek G, Miller DW, Slater JM. Hypofractionated proton beam radiotherapy for stage I lung cancer. Chest 2004;126:1198-203. Seco J, Panahandeh HR, Westover K, Adams J, Willers H. Treatment of non-small cell lung cancer patients with proton beam-based stereotactic body radiotherapy: Dosimetric comparison with photon plans highlights importance of range uncertainty. Int J Radiat Oncol Biol Phys 2012;83:354-61. 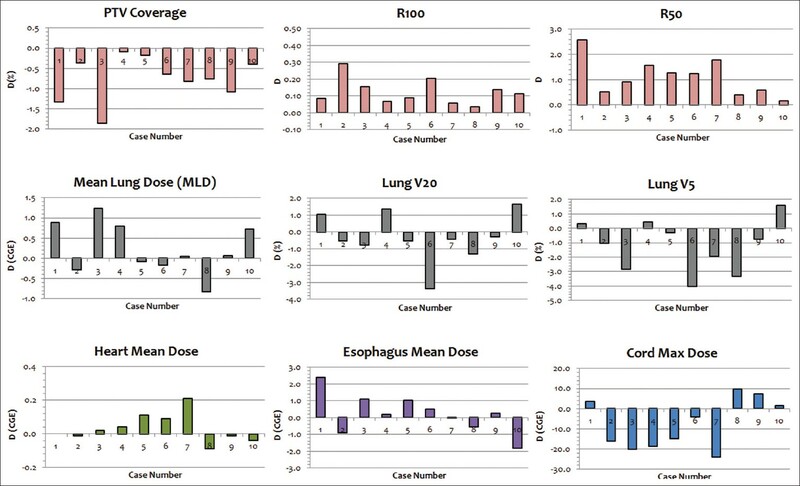 Wang C, Nakayama H, Sugahara S, Sakae T, Tokuuye K. Comparisons of dose-volume histograms for proton-beam versus 3-D conformal x-ray therapy in patients with stage I non-small cell lung cancer. Strahlenther Onkol 2009;185:231-4. Nichols RC, Huh SN, Henderson RH, Mendenhall NP, Flampouri S, Li Z, et al. Proton radiation therapy offers reduced normal lung and bone marrow exposure for patients receiving dose-escalated radiation therapy for unresectable stage iii non-small-cell lung cancer: A dosimetric study. Clin Lung Cancer 2011;12:252-7. Hoppe BS, Huh S, Flampouri S, Nichols RC, Oliver KR, Morris CG, et al. Double-scattered proton-based stereotactic body radiotherapy for stage I lung cancer: A dosimetric comparison with photon-based stereotactic body radiotherapy. Radiother Oncol 2010;97:425-30. Chang JY, Zhang X, Wang X, Kang Y, Riley B, Bilton S, et al. Significant reduction of normal tissue dose by proton radiotherapy compared with three-dimensional conformal or intensity-modulated radiation therapy in Stage I or Stage III non-small-cell lung cancer. Int J Radiat Oncol Biol Phys 2006;65:1087-96. Zhang X, Li Y, Pan X, Xiaoqiang L, Mohan R, Komaki R, et al. Intensity-modulated proton therapy reduces the dose to normal tissue compared with intensity-modulated radiation therapy or passive scattering proton therapy and enables individualized radical radiotherapy for extensive stage IIIB non-small-cell lung cancer: A virtual clinical study. Int J Radiat Oncol Biol Phys 2010;77:357-66. Auberger T, Seydl K, Futschek T, Sztankay A, Sweeney RA, Lukas P. Photons or protons: Precision radiotherapy of lung cancer. Strahlenther Onkol 2007;183:3-6. Macdonald OK, Kruse JJ, Miller JM, Garces YI, Brown PD, Miller RC, et al. Proton beam radiotherapy versus three-dimensional conformal stereotactic body radiotherapy in primary peripheral, early-stage non-small-cell lung carcinoma: A comparative dosimetric analysis. Int J Radiat Oncol Biol Phys 2009;75:950-8. Register SP, Zhang X, Mohan R, Chang JY. Proton stereotactic body radiation therapy for clinically challenging cases of centrally and superiorly located stage I non-small-cell lung cancer. Int J Radiat Oncol Biol Phys 2011;80:1015-22. Rana S, Pokharel S, Zheng Y, Zhao L, Risalvato D, Vargas C, et al. Treatment planning study comparing proton therapy, RapidArc and intensity modulated radiation therapy for a synchronous bilateral lung cancer case. Int J Cancer Ther Oncol 2014;2:020216. Zheng Y, Ramirez E, Mascia A, Ding X, Okoth B, Zeidan O, et al. Commissioning of output factors for uniform scanning proton beams. Med Phys 2011;38:2299-306. Rana S, Singh H. Impact of heterogeneities on lateral penumbra in uniform scanning proton therapy. Int J Cancer Ther Oncol 2013;1:01026. Hong L, Goitein M, Bucciolini M, Comiskey R, Gottschalk B, Rosenthal S, et al. A pencil beam algorithm for proton dose calculations. Phys Med Biol 1996;41:1305-30. Oshiro Y, Sakurai H. The use of proton-beam therapy in the treatment of non-small-cell lung cancer. Expert Rev Med Devices 2013;10:239-45. Hernando ML, Marks LB, Bentel GC, Zhou SM, Hollis D, Das SK, et al. Radiation-induced pulmonary toxicity: A dose-volume histogram analysis in 201 patients with lung cancer. Int J Radiat Oncol Biol Phys 2001;51:650-9. Stephans KL, Djemil T, Reddy CA, Gajdos SM, Kolar M, Machuzak M, et al. Comprehensive analysis of pulmonary function Test (PFT) changes after stereotactic body radiotherapy (SBRT) for stage I lung cancer in medically inoperable patients. J Thorac Oncol 2009;4:838-44. Grün R, Friedrich T, Krämer M, Zink K, Durante M, Engenhart-Cabillic R, et al. Physical and biological factors determining the effective proton range. Med Phys 2013;40:111716. Rana S. Clinical dosimetric impact of Acuros XB and analytical anisotropic algorithm (AAA) on real lung cancer treatment plans: Review. Int J Cancer Ther Oncol 2014;2:02019. Latifi K, Oliver J, Baker R, Dilling TJ, Stevens CW, Kim J, et al. Study of 201 non-small cell lung cancer patients given stereotactic ablative radiation therapy shows local control dependence on dose calculation algorithm. Int J Radiat Oncol Biol Phys 2014;88:1108-13. Lu L. Dose calculation algorithms in external beam photon radiation therapy. Int J Cancer Ther Oncol 2013;1:01025. Oyewale S. Dose prediction accuracy of collapsed cone convolution superposition algorithm in a multi-layer inhomogenous phantom. Int J Cancer Ther Oncol 2013;1:01016. Chaikh A, Giraud J, Balosso J. A method to quantify and assess the dosimetric and clinical impact resulting from the heterogeneity correction in radiotherapy for lung cancer. Int J Cancer Ther Oncol 2014;2:020110. Zhuang T, Djemil T, Qi P, Magnelli A, Stephans K, Videtic G, et al. Dose calculation differences between Monte Carlo and pencil beam depend on the tumor locations and volumes for lung stereotactic body radiation therapy. J Appl Clin Med Phys 2013;14:4011. Chang JY, Dong L, Mohan R, Liao Z, Cox J, Komaki R. Image-guided proton radiotherapy for medically inoperable stage I non-small cell lung cancer. Lung Cancer 2005;49:S93. Liu HH, Balter P, Tutt T, Choi B, Zhang J, Wang C, et al. Assessing respiration-induced tumor motion and internal target volume using 4DCT for radiation therapy of lung cancer. Int J Radiat Oncol Biol Phys 2007;68:531-40. Engelsman M, Rietzel E, Kooy HM. Four-dimensional proton treatment planning. Int J Radiat Oncol Biol Phys 2006;64:1589-95. Paganetti H. Range uncertainties in proton therapy and the role of Monte Carlo simulations. Phys Med Biol 2012;57:R99-117.